Even after the success of his full-length opéras-bouffes and the disappearance of the constrictions which had limited him in earlier days to writing and producing one-act pieces with tiny casts, Offenbach continued to turn out musical playlets of the kind with which he had originally made his fame. 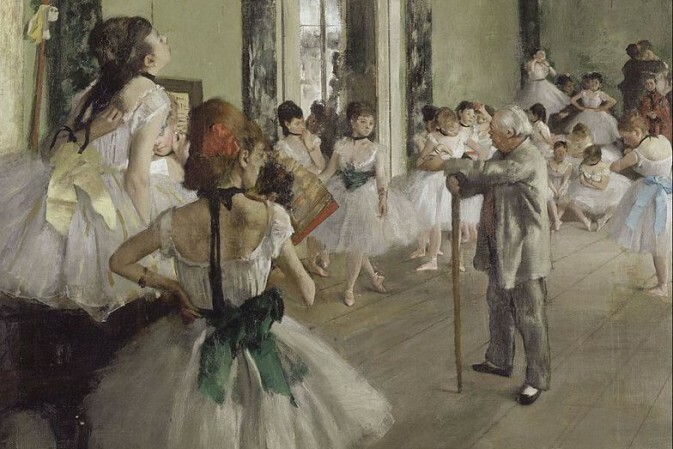 Of those few written in the last dozen years of his life, the most widely successful was the mini opéra-bouffe L’Ile de Tulipatan. It premiered at the Théâtre des Bouffes-Parisiens on 30 September 1868. 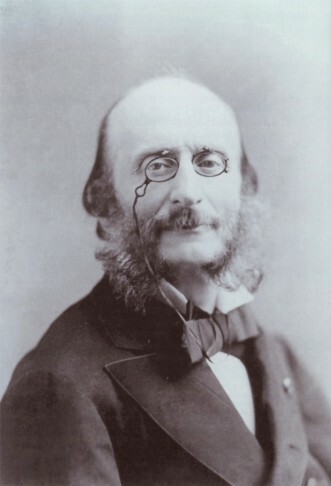 Composer Jacques Offenbach in the 1870s. Henri Chivot and Alfred Duru’s libretto was a full-strength, crazy burlesque based on that favourite theme, that things are seldom what they seem, a libretto which overflowed with sexual ambiguity, treated, as was usual at this time, with a laughing freedom rather than the pink-lipped purposefulness of a century later. The action was extravagantly set on the island of Tulipatan, “25,000 sea-kilometres from Nanterre, 473 years before the invention of the spittoon”. Alexis (Mlle Castello), son and heir of King Cacatois XXII (Berthelier), is actually a girl, whom the seneschal, Romboïdal (Bonnet), has had brought up as a boy for dynastic reasons. Hermosa (Victor), Romboïdal’s daughter, on the other hand, is a boy whom his mother, Théodorine (Mme Thierret), has brought up as a girl to avoid military service. Bouffe bit by bouffe bit, sexes and things get sorted out and, by the end, the two can be wed.
L’Île de Tulipatan was musically more substantial than some of the very shortest Offenbach pieces, with a score of a dozen numbers that included Cacatois’s zany and incidental burlesque barcarolle (“Dans Venezia la belle”) and the Couplets du canard (“Prince doux et fort débonnaire”) in which the monarch denies the bad press he has been getting, Théodorine’s nonsensically important-sounding excuse for an exit (“Je vais chercher les petites cuillières”), a lively piece for the `girl’ (“Vive le tintamarre”) and a pretty one for the ‘boy’ (“J’ai perdu mon ami”), as well as three duets. 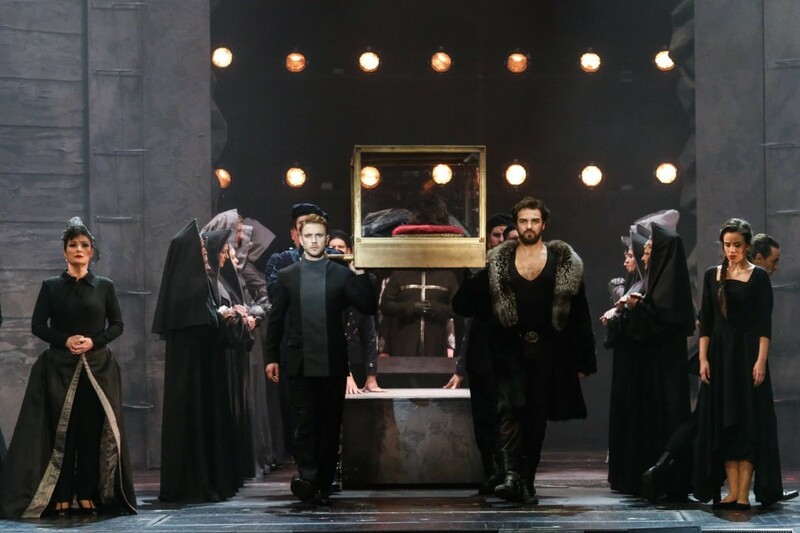 Tulipatan was a success first up in Paris, and it was seen the following year in Germany (ad Emil Pohl), in Hungary (ad Emil Follinusz) and in Austria (ad Julius Hopp), where it was staged on double-bills with Die schöne Galathee or Flotte Bursche with a royal cast featuring Josef Matras (Cactus), Hermine Meyerhoff (Oleander), Karl Blasel (Ficus) and Therese Schäfer (Aloe) for the earliest of its 35 performances in four years in the repertoire at the Carltheater. It also made its way to Britain, where it was played first, as King Kokatoo (ad F C Burnand), as an afterpiece to a touring production of W S Gilbert’s Pygmalion and Galatea, with Anetta Scasi/Marion Inch, Amy Burnett, T B Appleby, Edward Perrini and Helen Maxse featured, then in Edinburgh adapted by Charles Horsman as Charmian and Badoura, or The King of the Conjugal Islands (19 May), and then at the Opera Comique, as an afterpiece to Le Canard à trois becs, remade and retitled Kissi-Kissi (ad F C Burnand), described as “a Persian operatic bouffonerie”, and with Pattie Laverne appearing in the title-rôle. Largely helped by a staging which scandalously equated the Shah of the piece with the recently-visiting Shah of Persia, it was “better received by the audience than anything ever produced at the Opera Comique”, maintained on the bill when the main piece was withdrawn, and brought back later in the year. Out on the road, opéra-bouffe star Julia Mathews junked her whole touring repertoire of shows and took to playing nothing but this topical and hot Kissi-Kissi. In Australia, when the piece was finally shown there, it was in a different version, entitled Alexis, played by Amy Horton’s burlesque company with the lady as Alexis and John L Hall as Cactus. America, on the other hand, seems — unless the piece was played under some unrecognisable title — to have passed it by. Which may be why the plot of the piece was, apparently, largely lifted for Richard F Carroll’s fin de siècle Boston musical Kismet. Sheet music cover for the quadrille of Offenbach’s “L’Île de Tulipatan,” showing the cross-dressed protagonists. 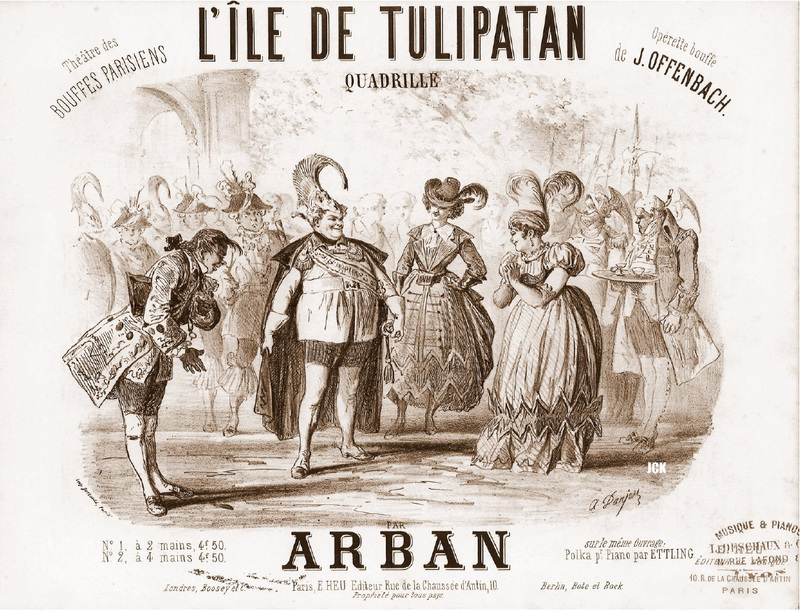 In Europe, L’Île de Tulipatan won numerous revivals over the years, being, amongst others, revived at the Carltheater by Franz Steiner (24 January 1889) with a cast including Karl Streitmann (Azalea/Hermosa), Wilhelm Knaack (Ficus/Romboïdal) and Frln Seebold (Oléander/Alexis), given at the Berlin Opera in 1917, and at the Vienna Staatsoper in 1918. In Hungary it appeared under a different title (XII Cactus) in 1891, but apparently in the same Follinusz translation in which it had been originally played more than 20 years earlier in Arad. The piece was most recently played in Paris in 1982, originally at the Festival du Marais and subsequently at the Théâtre de la Gaîté-Montparnasse (16 July), with Christian Pernot, Kay Fender and Pierre Jacquemont in the cast.